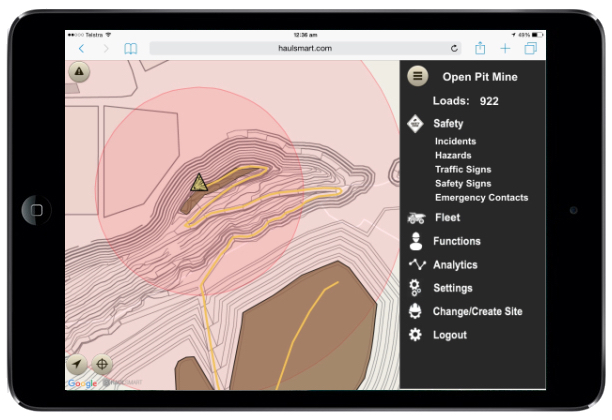 HAULSMART is a Cloud-Based Engineering Solution for Surface Mining, Earthworks and Haulage Projects. The 'Entry Level' App is available for free download on the App Store. 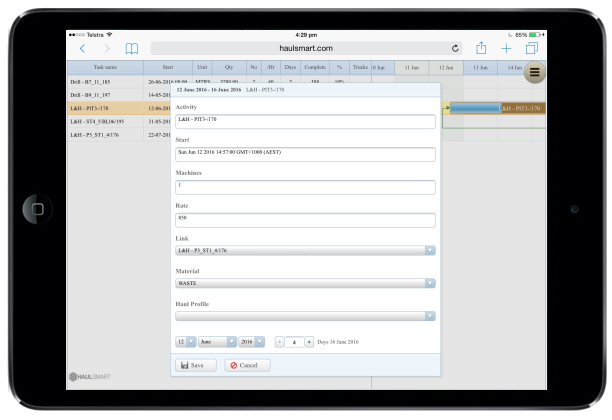 With no subscription required, the App uses In-App purchasing of Load Credit, enabling Users to perform basic data truck cycle data capture, review and export. 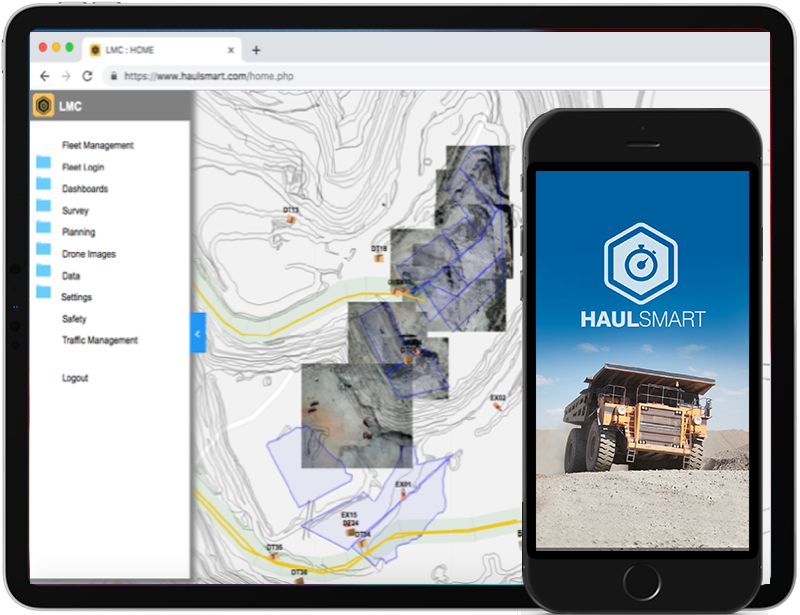 HAULSMART is a cloud based engineering solution for productivity and efficiency measurement and analysis of mining and earthworks equipment. 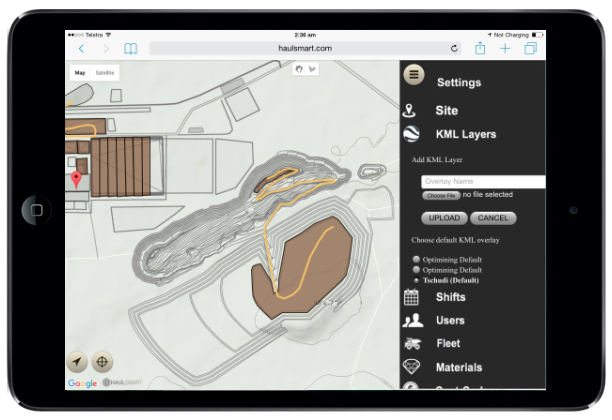 Using web apps for data capture, productivity and efficiency can be measured against site or project specific targets, with reference to OEM specifications. 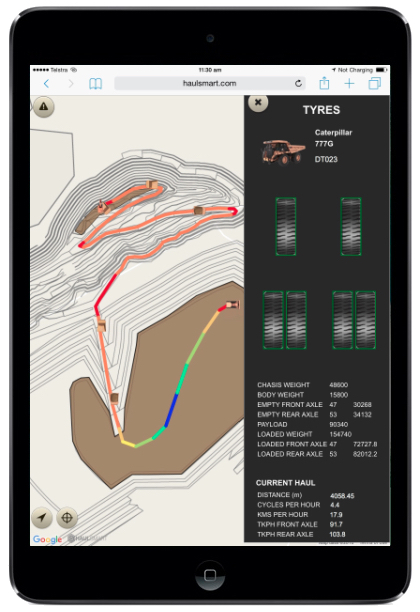 Using interactive Google Map displays, data for equipment, haul profiles and locations can be visually reviewed with dynamic charts and maps. 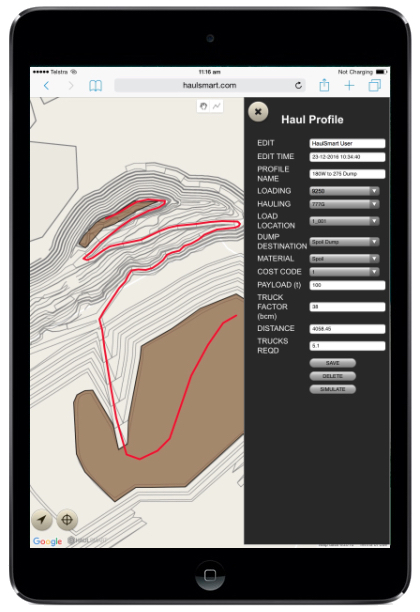 HAULSMART started as a single iOS App, developed to capture haulage cycle time data with basic website review and export, but with ongoing improvements to our website, our app is continually evolving with greater functionality, providing a unique engineering solution with cloud based data capture and analysis for any mining, heavy haulage or bulk earthworks project. Use any smartphone or tablet with web browser and internet connectivity as an in-cab display unit or in-field data capture device. Our website uses interactive Google Maps with intuitive controls, allowing project information to be easily shared with other invited users. Mobile devices have the functionality to be locked onto APPS and websites using Guided Access settings, disabling any distractions for operators and converting your device into a standard onboard display unit. This eliminates the concerns associated with using mobile devices in heavy equipment. Mounted fittings and cables are readily available, reducing installation and maintenance costs. Rental or Contractor equipment can be easily fitted with a mobile device without the cost and hassle of installing and uninstalling hardware, which is ideal for short projects. HAULSMART only stores data that the user uploads, and does not distribute any data or information to any third parties. We store your data on your Web Server Database, using Haulsmart API's for data capture and anaylsis. To provide User's with flexibility to scale their functionality according to their project's requirements, using both monthly subscriptions for website functions and purchasing of load credit. 1. IN-APP purchases of Load Credit only. This allows you to perform basic truck cycle data capture with the app only and limited data review functionality within this website. 2. Direct Invoicing for load credit and monthly subscriptions. To perform advanced data capture and review with this website, scaled according to you specific requirements, please contact us to recieve a quotation for estimated likely data usage per month, based on your project's User and Fleet quantity. Contact us today for a free trial to test this website and app functions. Carry out an application trial using our server, and then if you decide to proceed, we will launch your own secure and independent database and server instance on the cloud, where we can create customised solutions for your specific needs or requirements. In addition to our standard charts, we can also provide customised reporting for your project, accessible only to your project users. We can also customise solutions to capture and store data from other bluetooth or WIFI devices. Contact us to discuss our customised solutions. With the development of this website as a user friendly platform for data capture and project information sharing, we plan to continually improve with other engineering functions and data capture methods from other 'Internet Of Things' devices, connected via Wifi or bluetooth to your mobile device. Please stay tuned for these future updates. Contact us today to get an obligation free trial or demonstration of all website functions for 30 days. Invite your colleagues to join your project to assist in assessing HAULSMART's website functionality. We are also readily available to assist you with off-site setup of your project. With the ability to access our web apps with your readily available mobile devices, we offer the unique opportunity to test HAULSMART functionality without committment and upfront capital cost. As no 'off the shelf product' can readily suit all specific requirements of every project and site, our flexible system allows us to quickly adjust data output to suit your needs, without distribution and installation of software and device reconfiguration. OptiMining is an engineering consultancy company established in 2011. We specialise in providing project management, supervision and engineering services for mining and bulk earthworks construction projects. HAULSMART was developed to provide our consultants with a tool to capture, analyse and report productivity data as part of our offered services, specifically for projects without Fleet Management Systems or structured data and reporting processes. We also provide HAULSMART functionality to others using a subscription service, offering off-site support and engineering analysis when requested. With the growth of 'big data' and 'internet of things' in the Mining and Construction Industries, OptiMining can also provide technical assistance for development of site specific data capture processes. HAULSMART allows you to create a project and invite other users to join your project. Your project will be displayed on Google Maps, where survey files displaying roads, infrastructure and any other information can be uploaded. 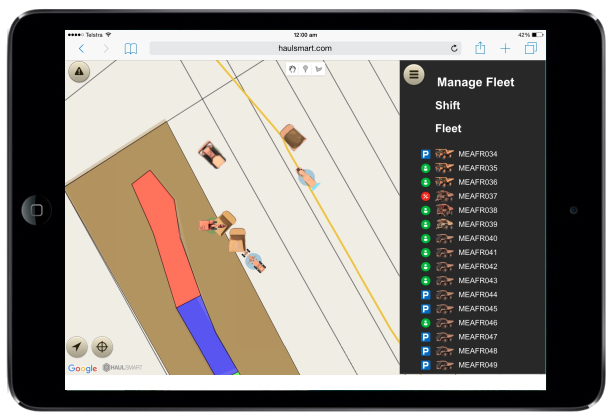 Engineers can plot or upload loading blocks and dumping destinations to display on the map, which automatically updates Charts and provides geofencing for Machine data capture. Each haulage profile can also be plotted or uploaded, automatically creating segments for cycle time calculations and geofences for Machine Data Capture. 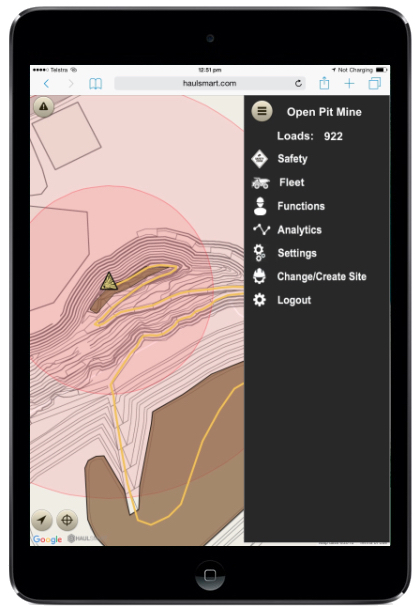 Data captured from Machine devices will upload to the cloud, automatically updating Charts, Reports and Interactive Maps, immediately accessible for review by Supervisors and Engineers on their mobile device. DO INVITED USERS ALSO SUBSCRIBE TO LOGIN IN AND CAPTURE DATA FOR YOUR PROJECT? No. You, as project's Administrator, purchase subscriptions for your project, and invited users' capture data under your subscription. HOW MUCH DOES THE WEBSITE SUBSCRIPTION COST? 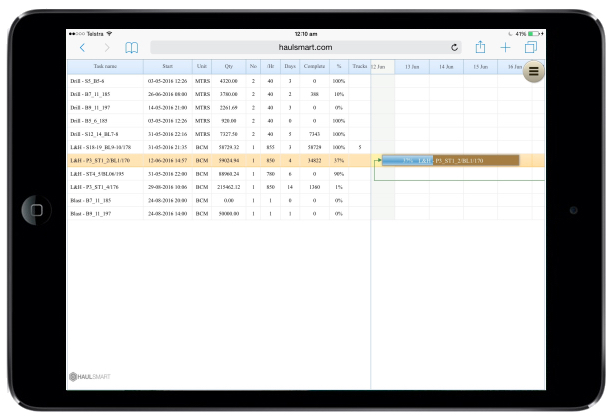 HAULSMART is a scalable solution, dependent on data transfer and storage on our cloud servers. The more data captured and accessed by multiple users will incur greater costs. We will assess your requirements based on operation, fleet and personnel usage, and determine monthly subscription fees accordingly. Alternatively, we can migrate our tables to your cloud server database, where you will incur a direct cost from your provider for data transfer and storage, and we will direct our Website API's for data capture and retrieval to your server for a monthly subscription fee. Please contact enquiries@haulsmart.com for further enquiries and estimated subscription costs for our service. WHAT OTHER OPTIONS ARE THERE TO SUBSCRIPTION? We offer an entry level option for HAULSMART, an iOS App available for free download from the Apple App Store, where the Project Administrator can purchase Project Load Credit @ US$0.05 per load using In-App purchasing. Each load captured by a user is deducted from the Project's load credit. This options provides basic data capture and website review, with the ability to export data in CSV format for your own calculations in your preferred software. HAULSMART is a great alternative for short term cycle time and motion studies. 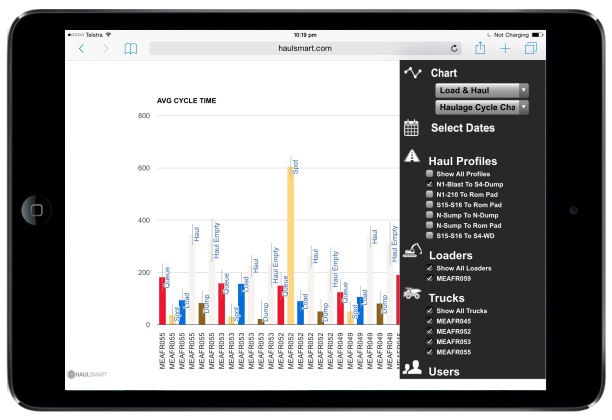 * The iOS HAULSMART App has limited features and currently only provides data capture for trucks. WHAT IF OUR PROJECT HAS NO OR POOR INTERNET CONNECTION? When you log into the website, you will need internet connection to upload all the current reference data from the cloud server onto your device in order to populate selections and generate interactive maps. Once done, data can be captured onto the device and then uploaded to the cloud when internet connection is restored. In order to update reference data if changes or updates made, then the website will need to be refreshed with internet connection. * Updating of machine positions on the map does require internet connection. Without frequent updating, machine operators will be required to undertake more manual input. HOW CAN WE PREVENT OPERATORS FROM ACCESSING OTHER WEBSITES AND APPS ON THE DEVICE WHILST OPERATING A MACHINE? With the correct settings on your device, you can lock an App so that no other functions work on the device. You can lock a web browser to only permit access www.haulsmart.com and no other websites are accessible. With these settings you can turn a tablet into a standard onboard display unit, eliminating distractions and unauthorised use of other device functions. The term 'HAULSMART' or 'us' or 'we' refers to the owner of the website, OptiMining Pty Ltd. Our Australian Business Number is 24161280593. The term 'you' refers to the user or viewer of the website. - We do not provide any warranty or guarantee as to the accuracy, timeliness, performance, completeness or suitability of data capture offered on this website by the user. You acknowledge that such information or materials may contain inaccuracies or errors and we expressly exclude liability for any such inaccuracies or errors to the fullest extent permitted by law. - Your use of any information or materials on this website is entirely at your own risk, for which we shall not be liable. It shall by your own responsibility to ensure that any products, services or information available through this website meet your specific requirements. - We are not liable for inappropriate use of our website by you by which your use contravenes safety policies and procedures . It shall be your own responsibility to ensure that you use this website in accordance with governing safety policies and procedures of the country in which you are using the website, or the company in which you are employed. - This website contains materials which is owned by or licensed to us. This material includes, but is not limited to, the design, layout, look, appearance and graphics. Reproduction is prohibited other than in accordance with the copyright notice, which forms part of these terms and conditions. - From time to time this website may also include links to other websites, These links are provided for your convenience to provide further information. They do not signify that we endorse the website(s). We have no responsibility for the content of the linked website(s). 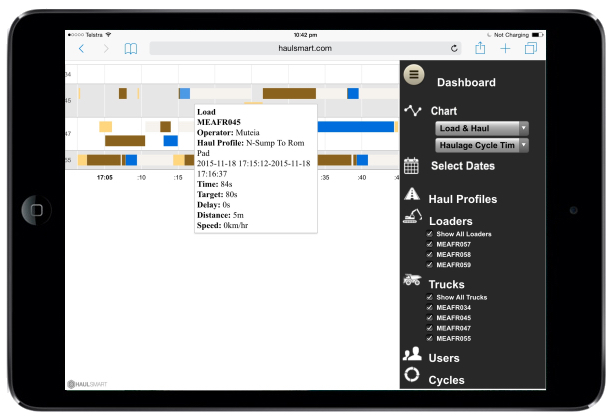 HAULSMART provides easy tools to capture cycle time data for each haulage profile, to not only calculate the theoretical cycle times and trucking requirements, but to also monitor actual performance against design targets. 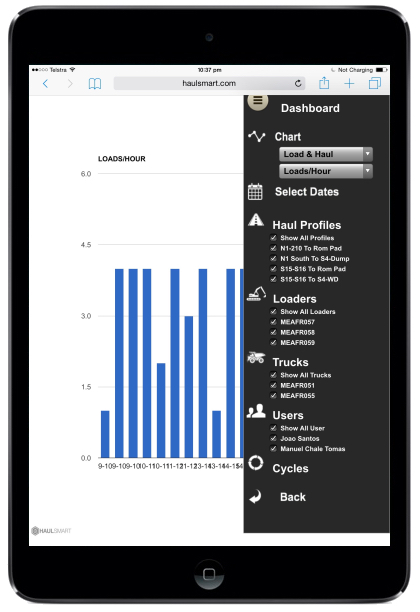 Easily plot or import haul profiles from survey files, or record haul profiles in the field using your mobile device, calculating theorectical cycle times using OEM rimpull data and site specific default segment speeds. Each haul profile is broken into segments, separated by waypoints or plotted points, automatically generating geofenced areas based on total running width. 2. Drag and Drop GeoJSON files. 3. Record the route using a mobile device. 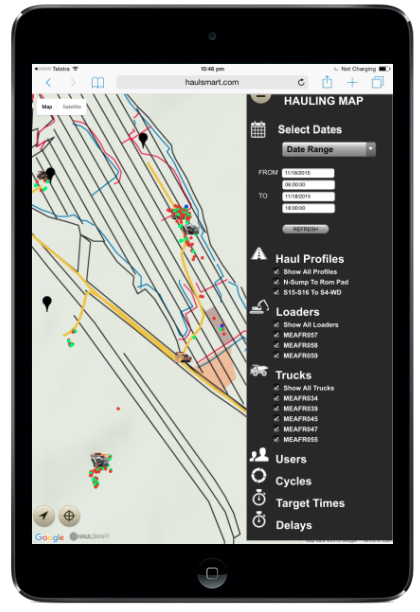 Capture waypoints along the haul profile as you drive at the expected loaded haul speed, which will automatically calculate haul and return times and subsequent truck requirements. 4. Plot the route and manually input gradients for each profile segment. When a haul profile is selected by the operator, travel times for each haul profile segment are captured, providing detailed analysis of haul performance. Detailed analysis of road maintenance costs can be undertaken by capturing data from ancillary equipment (Graders, Watercarts etc) working in each segment. Each segment can be assessed for rolling and effective resistance, and pavement conditions, for detailed analysis of tyre wear and operational history. HAULSMART refers to a Manufacturer Equipment Database of theoretical rimpull and braking performance charts to calculate theoretical travel speeds and times for profile segments. Users can store default speeds for each profile segment type in order to override the Manufacturer's theoretical speed calculations. After calculating haul profile cycle time speeds and durations, HAUL SMART calculates theoretical tyre tkph rating's using manufacturer payload distribution specfications. This calculation provides a guide for monitoring tyre tkph during haulage cycles. THE HAULSMART WEBSITE USING DYNAMIC REFERENCE CHARTS FOR MANUFACTURER SPECIFICATIONS. INTERACTIVE MAPS AND ICONS WILL DISPLAY MACHINE SPECIFICATIONS AND CHARTS FOR EASY ENGINEERING ANAYLYSIS OF PERFORMANCE AND EFFICIENCY. DYNAMIC MANUFACTURER CHARTS INCLUDE RIMPULL AND BRAKING CURVES. Easy menu options for setting up your site or project. 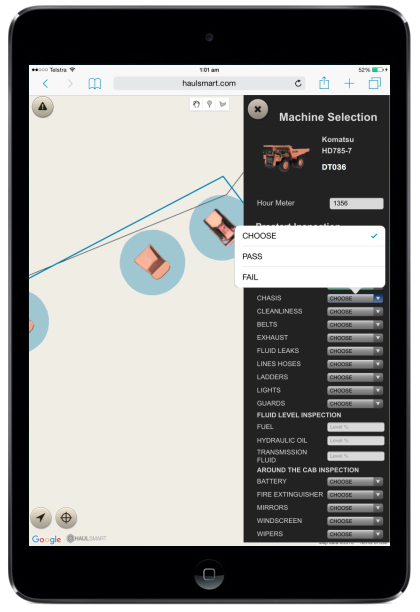 Add KML overlays, Shifts, Users, Fleet, Materials and Cost Codes with simple drop down selection lists. Select your fleet's models from our extensive equipment and specifications database, with adjustable fields to suit your own site conditions. Easy Pay Pal purchasing functions for your site users. Create and store your maps to share with other users, who can use to their mobile device GPS to reference their position on your map. Upload KML files generated from other software, such as Google My Maps, and set as default layer for other users to view the current map on their mobile device. Drag and Drop survey files converted to JSON format to easily update your map. 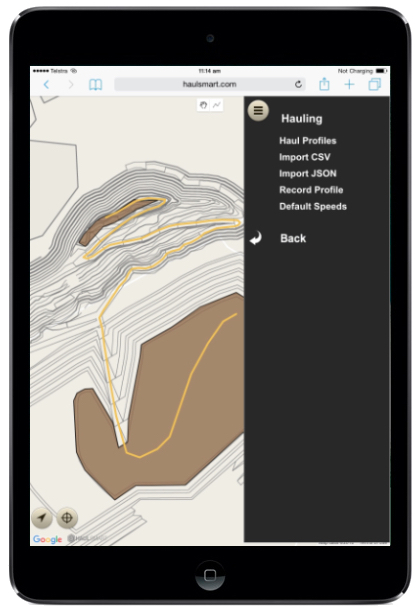 Easily save and store daily maps on the Haul Smart database for reference when reviewing historic data, including loading and dumping faces. Export your map in KML format for use in other softare, such as Google Earth. 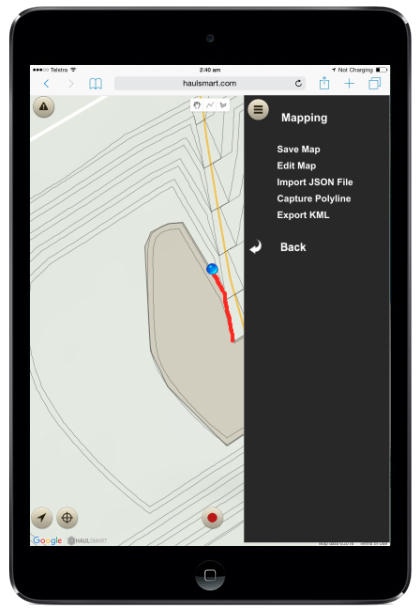 Use your mobile device to edit your map in the field, drawing or deleting lines using your mobile device GPS. Capture string lines as you walk, such as moving work faces (dig face toes/crests), and instantly store to update displays on your map. Easily plot or import JSON polygons for loading, dumping or stockpiling locations, calculating areas, volumes, and tonnages for short term production scheduling. 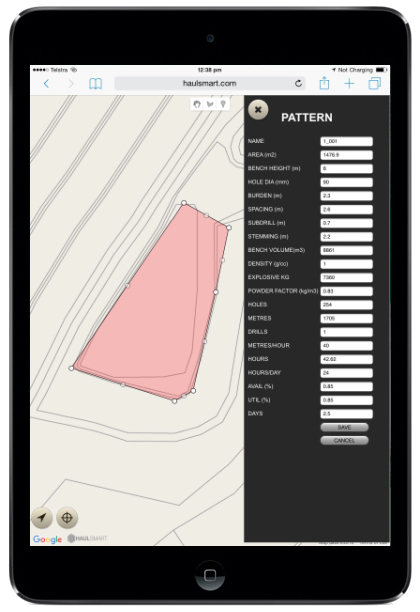 Plotted or imported polygons immediately update the Gantt Chart Schedules, and provide geofencing areas for Machine Web Apps, reducing operator manual input requirements. Interactive and dynamic Production Scheduling Gantt Chart, automatically updated from other planning and data capture functions. Share progress reporting with other users. Plan and monitor stockpile balances and grades. 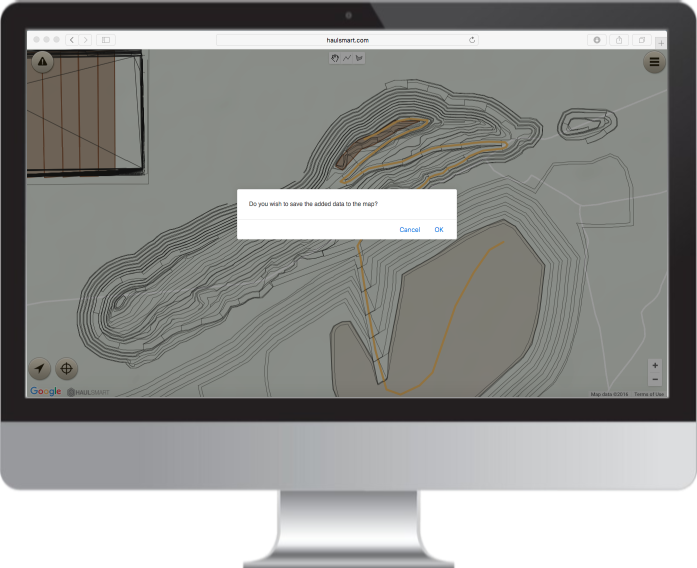 When a User logs in, they are immediately presented with the current site map and all current shared information, including but not limited to: Safety, Haul Profiles, Loading and Dumping Areas, Drilling Patterns etc. The Map is interactive, allowing users to click on areas and icons to get further information and details. Visually review cycle time data by location, for any date range, with easy recognition of over/under target color codes. Easily review data by profile, unit, loader, truck, user, cycle and target using dynamic filters. Operators can review their inputted data only, whilst supervisors and managers can filter all operator data. The interactive map allows clicking of lines, markers and icons to obtain further detailed information. Visually identify delay locations and durations, filtered by cycle activity.. Export a csv data file based on the filters selected on the map, with the option to delete the filtered data. Easy review of truck haulage cycle times using dynamic timeline charts. Quickly assess actual cycle times versus targeted theoretical cycle times. Easy visual identification of over/under trucking by frequency and duration of queuing, or loader waiting time between loads. Our cycle time charts are dynamic and interactive. Click on segment cycle times for further details. 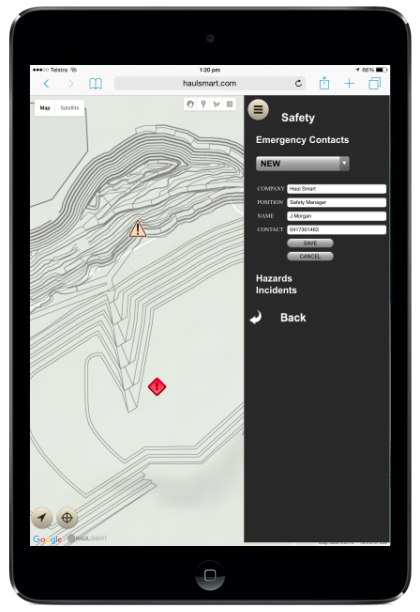 Users can easily capture location of hazards and incidents, uploading photos and further information, immediatley notify supervisors. Plot safety and traffic management signage. Upload drill patterns in CSV format for map displays. 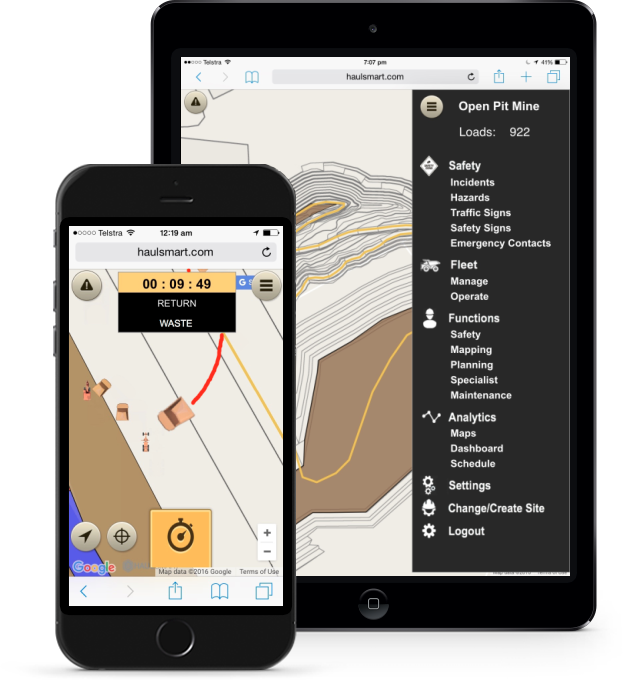 Easily manage which patterns will be displayed for drill operators and shot crew. Easily add additional holes in the field. Drill operators can then select holes for drilling, capturing penetration rates and actual depths drilled. 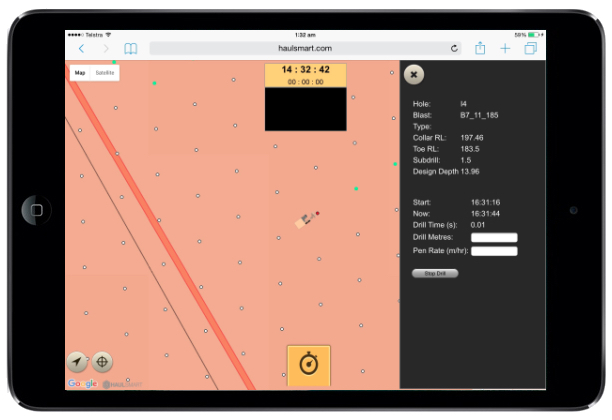 Shotcrew can easily perform QA checks by dipping holes to verify drillers hole depth vs design. Monitor drill pattern progress in realtime with holes completed/remaining. 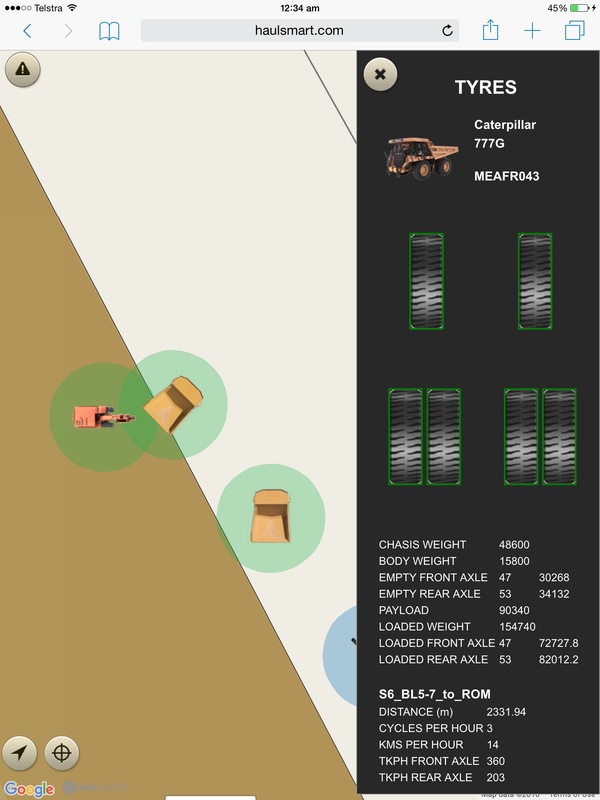 Patterns immediately displayed on maps for drill operators. Share blasting information, such as location, data and time, with all users. Display personnel and equipment blast clearance perimeters, allowing users to see their device GPS location for equipment relocation during blasting procedures. 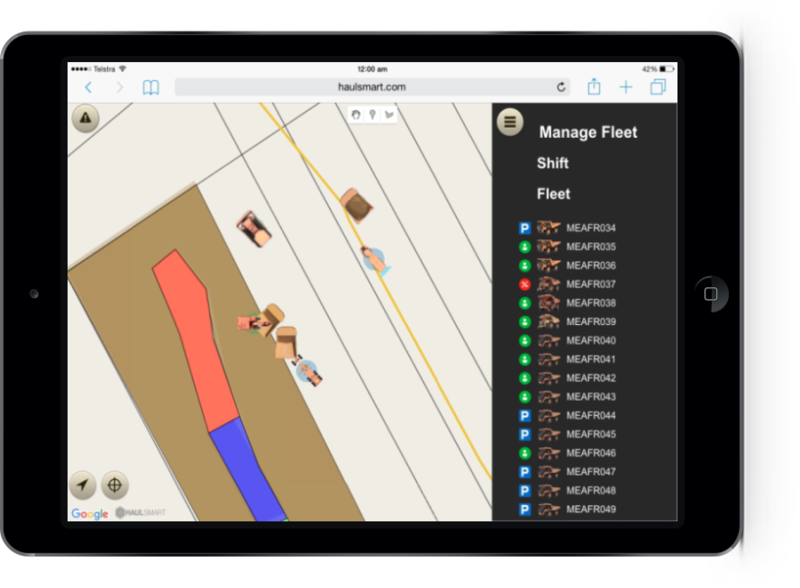 Map based Fleet Management with Drag and Drop Functionality, making it easy to manage your machines in the field on your mobile device. 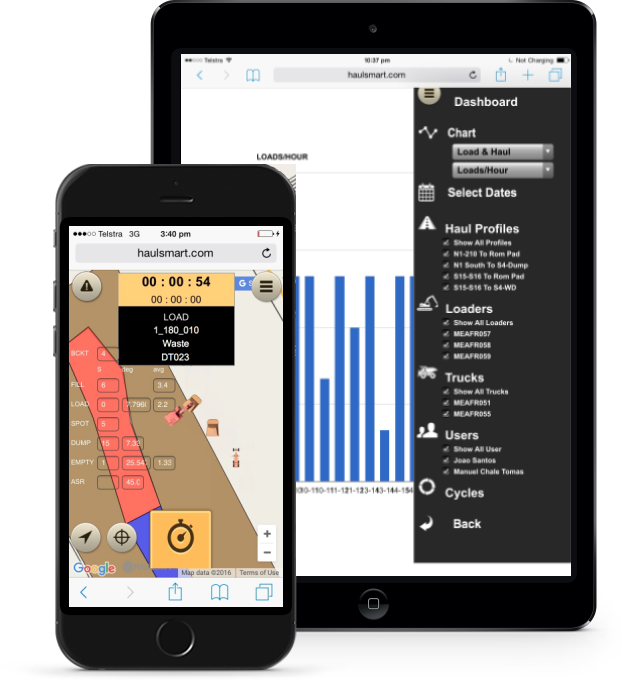 Easily manage a shift with operating, idle and down time for each machine with interactive map and menu icons. The map machine locations and operating data can be updated automatically from operators with in-cab devices. Timekeepers in the field can manage machine locations, operators and hours without placing a device in the cab. Drag and drop functionality allows time and motion studies to be carried out on a single mobile device, dragging and dropping machine icons to capture cycle timestamps and approximate positions. Orespotters can manage loading machine details, automatically assigning details for each truck load, and monitoring of truck haulage to ensure correct dumping. 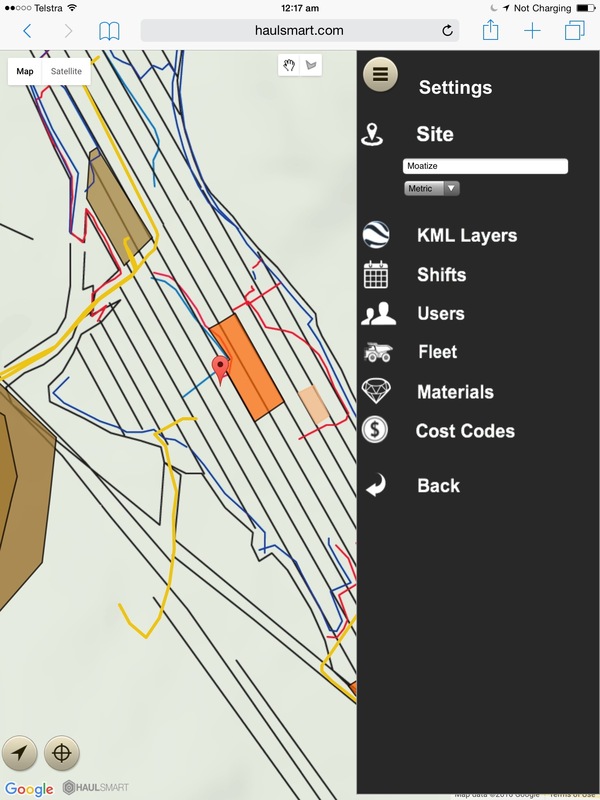 Map overlays of blocks, patterns, dumps etc automatically populate selection options with machine icon drag and drop, reducing input and speeding up data capture. Monitor tyre TKPH's in real time. Compare OEM TKPH rating versus those achieved in the field. Interactive prestart checklist for each machine. Failing a Category A or B prestart check automaticaly places the machine on maintenance. Capture and upload photos of prestart defects, alerting supervisors and workshop with immediate notifications. Easy data capture of each haulage cycle component: QUEUE, SPOT, LOAD, HAUL, DUMP, RETURN: durations, distances, maximum speeds and elevations. Reduced operator input with loading machine and location awareness and geofencing. Capture haulage paths, distances, speeds and durations of each haulage cycle component. Automatic capture pull away from loading machine times and speeds, to analyse working area conditions. Automatic capture of stationary (delay) durations and GPS positions. Monitor haul profile rideability (conditions) with Gyrometer data capture. 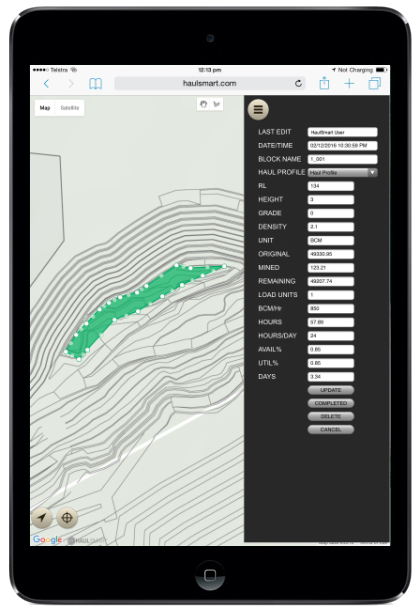 Use your mobile device (fitted with GPS, Compass and Gyrometer) to capture bucket swing durations and radius, plus bucket fill time to identify material diggability. 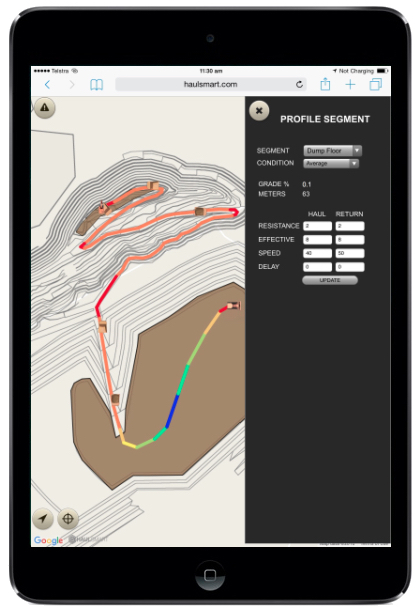 Capture travel paths, distances, speeds and durations of excavator movements. Capture delay durations associated with spotting, waiting and cleanup at the face. Capture other activities such as Battering and Trenching. Loading details (Location, Destination, Material, Haul Profile and Loading Machince) can autopopulate Truck load details, reducing operator input. Ideal for Orespotters. Use your mobile device (fitted with GPS, Compass and Gyrometer) to capture Dozer pushing distances and durations. 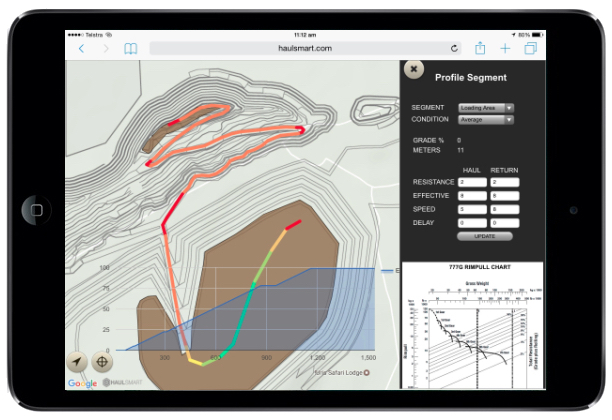 Capture travel paths, distances, speeds and durations of dozer movements. Capture ripping distances and durations to measure material diggability. Capture forward/reverse durations and distances, and stationary durations, to calculate dozing productivity and efficiency. Use your mobile device (fitted with GPS, Compass and Gyrometer) to capture Grader distances and durations. 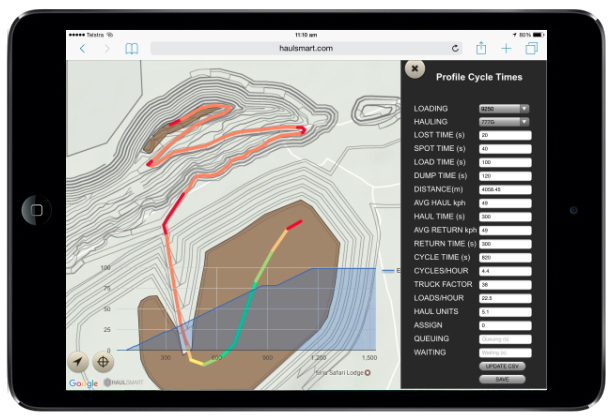 Capture travel paths, distances, speeds and durations of Grader movements. Capture grading distances and durations to measure grading metres/hour. 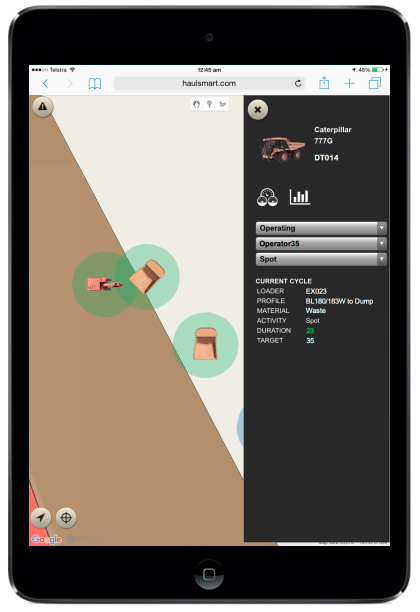 Capture stationary durations to calculate Grader productivity and efficiency. Use your mobile device (fitted with GPS, Compass and Gyrometer) to capture Water Bowser spraying distances and durations. Capture travel paths, distances, speeds and durations of Water Bowser movements. Capture water application distances and durations to measure water quantities and litres/metre. Capture stationary durations to calculate Water Bowser productivity and efficiency. Use your mobile device (fitted with GPS, Compass and Gyrometer) to capture loading/unloading durations. 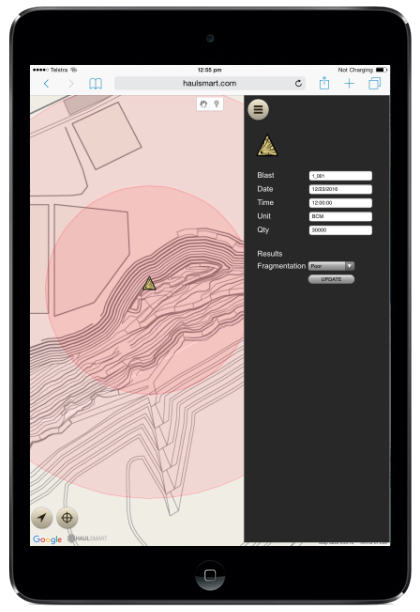 Reduced operator input with lmachine and location awareness and geofencing. Monitor Plant Feed tonnage and blend with FEL stockpile material and buckets. Capture tramming paths, distances, speeds and durations of FEL movements. Capture stationary movement durations to calculate FEL productivity and efficiency. Use your mobile device (fitted with GPS, Compass and Gyrometer) to capture each haulage cycle component: QUEUE, SPOT, LOAD, HAUL, DUMP, RETURN. Reduced operator input with loading machine and dumping location awareness and geofencing. Capture travel paths, distances, speeds and durations of scraper movements. Capture stationary movement durations to calculate scraper productivity and efficiency. Use your mobile device (fitted with GPS, Compass and Gyrometer) to capture Roller pushing distances and durations. Capture travel paths, distances, speeds and durations of rollers movements. Capture the number of passes. Capture stationary movement durations to calculate roller productivity and efficiency. 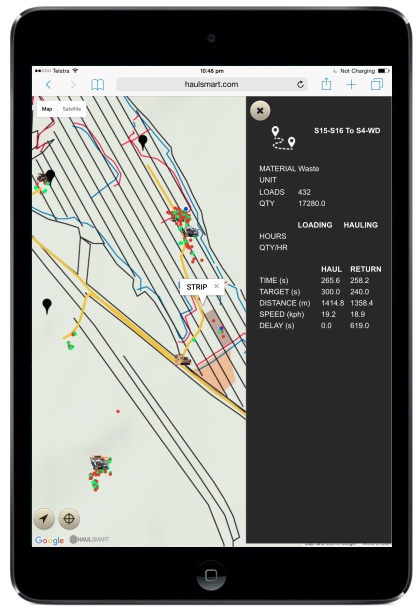 Use your mobile device (fitted with GPS, Compass and Gyrometer) to capture Drilling data. 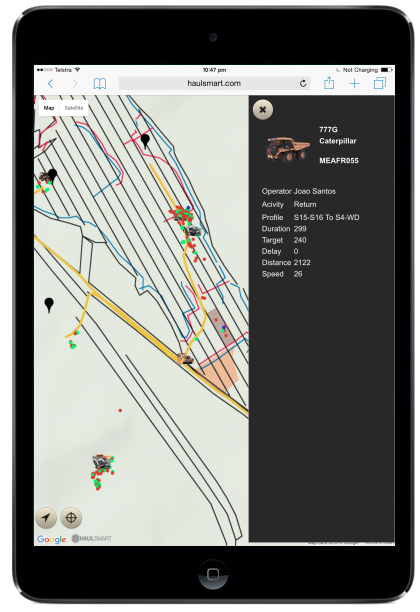 Drill Pattern maps automatically updated on the operator's device. Capture travel paths, distances, speeds and durations of drill movements. Capture start and stop drill hole times and drilled depths to calculate penetration rates. Capture duration of drill bit and rod changes, and calculate drill bit wear rates and rod hours. Forgot Password? Or Locked Out? Then invite others to join. Please enter your email address, and we'll reset your password.